Cinder's art was born of the "empty nest syndrome". While she had always "played" at art for most of her life, doing it seriously started when her youngest son went off to college in 1992. In her earlier days she would do artistic things for fun, for example, painting wonderfully exotic animals on the walls of the upstairs bedrooms of our house where our two boys spent so much of their time. While Art for many years took a back seat to her love of music, in 1992 she attacked art like she does so many things in Life, with dedication and energy. She started with Art lessons at her local county art association where at her first lesson she asked the teacher what was the first thing she should do with her new fresh canvas. With some amusement, her teacher informed her that a good first step would be "to take the plastic wrapping off the canvas". From this humbling beginning she painted 50 pictures that first year finding subjects in everything around - her family, home, gardens as well as her piano students. She immersed herself in painting to improve her techniques as well as to find her own natural style. Soon she was doing shows around New Jersey and selling her paintings. Having her art so well received was the encouragement she needed to branch out and expand her offerings. One of the main sources of new fresh material for her pictures came from her world travels, to the Orient, MidEast as well as Europe. 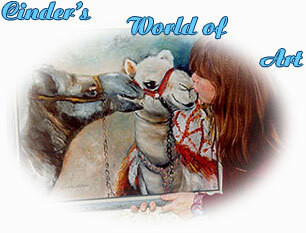 In all of her paintings you will find that her use of vivid colors in her trademark. So take a few moments and peruse her many offerings. She has divided up her hundreds of paintings into broad categories: music, various countries, flowers, etc. so that it is easier to find something you would like. While many of her original paintings are for sale, her most popular offerings are the limited edition prints and greeting cards she has made from her paintings.